Beheading carried out by ISIL or by the SAS? [F]riday, October 3, 2014 ISIL published the fourth video of its kind, showing the alleged beheading of the British citizen Alan Henning. The executioner in all four videos spoke English with a distinct British accent. In June 2012 a senior Whitehall official told The Daily Star that UK special forces and the UK’s foreign intelligence service MI6 are operating in Syria. The authenticity of the video featuring the beheading of the British aid worker and cab driver Alan Henning could not be independently verified. The British Foreign Ministry stated the following Friday evening that it is working at it. US officials could not yet verify the authenticity either. The alleged killing of Alan Henning was, however, condemned by officials from all member states of the alliance against ISIL and by the UN Security Council. Investigating the authenticity and the veracity of the latest video has become virtually impossible for independent media since western nations declared a war against ISIL’s Internet propaganda. The videos, which allegedly have been produced by the terrorist organization ISIL, are edited so as to fade to black before the actual beheading begins. This editing feature may be consistent with the BBC’s and generally accepted European media ethics, but it defeats the very purpose of terrorism. That is, instilling intense emotions of fear and helplessness. “In my opinion, this bloke has been born and raised in the UK. He learned English as first language, and there is no way that he is a first second or third generation immigrant to the UK”. Arguably, it was not the fact that ISIL spreads propaganda, but the fact that independent investigative journalists could come dangerously close to revealing a possible SAS and MI6 operation, could have been the primary reason for banning ISIL propaganda from the Internet. The beheading of the British aid worker and cab driver Alan Henning coincided with growing public opposition against the UK’s involvement in air raids against alleged ISIL targets in Syria. It is unlikely that Cameron would want to risk a repetition of the defeat he suffered one year ago. September 29, 2013, the UK parliament voted against the UK’s participation in military strikes against ”the Assad regime”. The Cameron government’s motion to use force against Syria, if necessary, was rejected by 272 votes to 285, a 13 vote majority. Several Tory ”rebels” had joined Labour and defeated Cameron’s push for war. A new vote on the same issue was out of the question. The UK’s rejection of strikes against Syria forced the hand of war hawks within the Obama administration to cancel long-planned military strikes against Syria. The development could have turned into a serious political quagmire for Obama; had it not been for the fact that Russian UN Ambassador Vitaly Churkin and Russian Foreign Minister Sergey Lavrov offered a helping hand by convincing Syria that it would be advantageous to accede the OPCW’s Chemical Weapons Convention. In June 2012 a senior Whitehall official admitted that British, French, Turkish, and probably also US and other special forces are operating in Syria. In June and July 2012, some 20,000 mercenaries of the so-called Libyan Brigade launched an attack against Syria across the Jordanian – Syrian border from an area near the town of AL-Mafraq. US special forces, the CIA, DIA, and the intelligence services of numerous other nations belonging to the anti-Syrian alliance are represented in Al-Mafraq and in part at the Ramtha air base. “The jet did not approach the region from the direction of the Turkish border and it was not headed toward the Turkish border when it was struck and burst into flames. It looked like a missile was fired at the plane from the direction of the border”. “We have seen Turkish special forces alongside the terrorists in Kessab area two days ago and others have seen them too. The Turkish military has fired heavy and medium caliber artillery rounds and tank shells at our army positions over the last days, I think the special forces are directing their fire”. UN Security Council Resolution 2118 contains a provision that would allow the use of force under the UN Charter’s Chapter VII is Syria fails to comply with its obligations under the OPCW’s Chemical Weapons Convention. It would, however, require a new vote at the Security Council which could be vetoed by Russia and China. Establishing a no fly zone to protect the predominantly Kurdish – Syrian population in eastern Syria without UN Security Council approval is much more simple. Seen from a psychological perspective, the death of one British volunteer aid worker at the hands of ISIL has a significantly greater impact on the British population’s willingness to accept the illegal bombing of targets in Syria than the death or displacement of thousands of Syrians. ISIL has served multiple purposes. It delivered a pretext for regime change in Iraq and the installation of a more pro-Western government. It weakened the position of Iran. It served as a pretext for the deployment of additional special forces and air raids in Iraq. Most importantly, ISIL and the alleged beheading of Alan Henning served as pretext for bombing targets in Syria without the need to remind the British public about the fact that the UK parliament already voted against it one year ago. Funding ISIL is, indeed, money that is well spent. ISIL exports stolen Syrian oil, earning an estimated $3 million per day. In April 2013, the EU Foreign Ministers agreed to lift the EU’s ban on the import of Syrian oil from “rebel-held territories”. The ability to launch air strikes in Syria’s oil-rich province of Deir Ez Zour translates into two advantages. The advantage to implement an illegal no-fly-zone without bothering about international law and the UN Security Council. The advantage to decimate mercenary units which are non-compliant with Western ambitions. The alleged beheading of Alan Henning could not have come at a more convenient time for the government of David Cameron. Whether the ISIL terrorist with British accent is a genuine ISIL mercenary, a member of the SAS, or an MI6 agent is a minor detail. What counts is the emotional impact on the British population which is being railroaded into demanding that the UK gets involved in an illegal war on Syria without remembering that parliament voted against it one year ago. 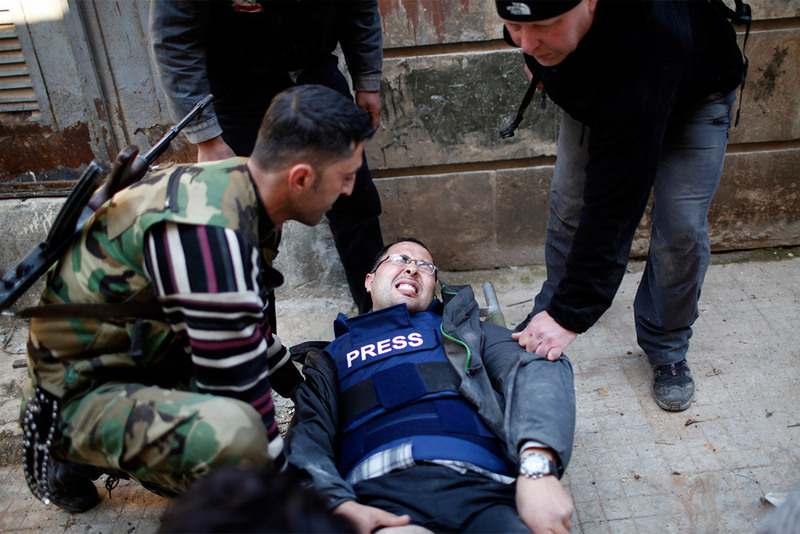 Were the governments of the United States and the United Kingdom genuinely concerned about the death of journalists and aid workers, one could argue, that they would be as concerned about the assassination of journalists like Maya Nasr, Yara Abbas, and Serena Shim. Maya Nasr was shot and killed by a sniper in Damascus in September 2012. Nasr, who reported for Al-Alam and PRESS TV was investigating the release of terrorism convicts from Turkish prisons to fight in Syria when he was murdered. In May 2013 Yara Abbas, who reported for the privately owned Syrian TV channel Al-Ikhbariya, was murdered en route to a meeting with senior associate fellow at Oxford University’s St. Anthony College, Sharmine Narwani. Abbas had been embedded with the Syrian Arab Army for nine days and could have reported about the transgressions committed by the foreign-backed “opposition”. In October 2013, the U.S.-American correspondent for PRESS TV in Turkey, Serena Shim, died in a car crash after reporting about the situation at the Syrian – Turkish border and the U.S. and UK air strikes on Ayn Al-Arab a.k.a. Kobane. Colleagues of Serena Shim would report that Turkey’s intelligence service MIT had accused her of spying and that she was very worried before she died in the car crash. None of these deaths were debated by the UK parliament, the U.S. Senate or by the US or UK administrations. Media coverage in Western mainstream media was non-existent or negligible, while the beheading of Scottloff, Foley and Henning made the headlines. These beheadings, whether they were real or not, have successfully vilified and demonized ISIS while it, for all intends and purposes still receives covert support from Saudi Arabia, the USA and the UK or rogue networks embedded in these countries political systems and in their intelligence services. The use of this demonization and propaganda campaign served as justification for bombing raids in Syria, in violation of international law and Syrian sovereignty. The U.S. and UK had jointly carried out some 80 air raids which have proven largely ineffective. Two air drops of weapons to the PKK associated Syrian Kurdish YPG ended up in the hands of ISIS groups who were attacking Ayn Al-Arab. Such “mistakes” don’t only arm ISIS. They also served as a pretext for calls on expanding the UK’s involvement in the illegal air raids in Syria and they were used for renewed calls for boots on the ground in Syria. Considering all of the above as circumstantial evidence that could be brought before a court of law, or a public inquiry, there is reason to call for full and transparent investigations into the beheading of Allan Henning, Steven Scotloff, James Foley. The most plausible utility of the murders, whether real or unreal, is the justification of illegal acts of aggression against Syria. Considering that as premise for an investigation or prosecution, the prime suspects would have to be found within the MI6, the CIA, the Turkish MIT, or any NATO members special forces. Friday, October 3, 2014 ISIL published the fourth video of its kind, showing the alleged beheading of the British citizen Alan Henning. The executioner in all four videos spoke English with a distinct British accent. In June 2012 a senior Whitehall official told The Daily Star that UK special forces and the UK’s foreign intelligence service MI6 are operating in Syria. 20121231-syriaWere the governments of the United States and the United Kingdom genuinely concerned about the death of journalists and aid workers, one could argue, that they would be as concerned about the assassination of journalists like Maya Nasr, Yara Abbas, and Serena Shim. Maya Nasr was shot and killed by a sniper in Damascus in September 2012. Nasr, who reported for Al-Alam and PRESS TV was investigating the release of terrorism convicts from Turkish prisons to fight in Syria when he was murdered. Posted in COVERT OPS & INTELLIGENCE, GUEST AUTHOR, ISIL/ISIS/IS, LIES AND PROPAGANDA, SOMETHING STINKS.